This religious Renaissance art tapestry "The Creation II" shows a work taken from the Sistine Chapel, where God creates Adam. The Sistine Chapel in the Vatican City is famous for its master works on its frescos and ceiling. Indeed a work of wonder and spectacular artistry, the chapel ceiling was painted by Michaelangelo between 1508 and 1512 under the patronage of Pope Julius II. In this work, we see the moment of creation where God creates Adam symbolised by a touch of the finger. A famous quotation about the Sistine Chapel is by Goethe "Without having seen the Sistine Chapel one can form no appreciable idea of what one man is capable of achieving." The creation is perhaps one of the most famous portions of the Sistine chapel. 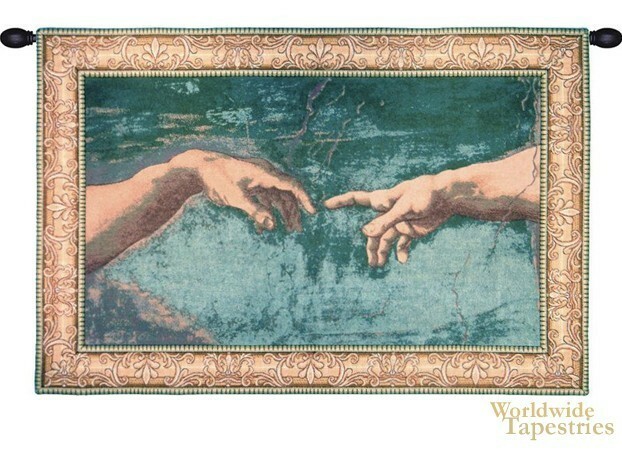 This religious Renaissance art tapestry "The Creation II" is backed with a lining and has a tunnel for easy hanging. Note: tapestry rod and tassels, where pictured, are purchased separately. Dimensions: W 38" x H 25"